Generally, sicker Canadians are more likely to have below-average income (they are also less likely to have post-secondary education, and tend to be older and live in a rural community), so often cannot pay for their medications. The medications, whether they are needed to reduce pain, prevent complications from their disease, or to treat the underlying disease process, contribute to a better quality of life, to greater economic productivity, and reduced healthcare costs. These are the people, more than anyone else, who need medications included on public formularies. “Sicker Canadians” — the term used in the Canadian Health Care Matters series to mean their sample of survey respondents with chronic conditions who reported being in fair or poor health. “Health Council of Canada — An independent, nonprofit organization, funded by Health Canada, that reports on the progress of national healthcare reforms. Yet astoundingly, almost one-quarter of Canadians in fair to poor health reported not filling a prescription, or missing a dose, because they could not afford their medications . . . compared to one in ten from the general population. Rheumatoid arthritis and osteoarthritis alone cost the Canadian economy approximately $33 billion due to the direct expense of healthcare and the indirect costs of lost productivity. Higher numbers of hospital stays, surgeries, emergency department visits, and prescriptions are associated with chronic disease, making it expensive for Canada’s healthcare system. Many provincial governments in Canada have signaled that their health regions will be directed to move from an acute care model to a more diverse, chronic care management model. 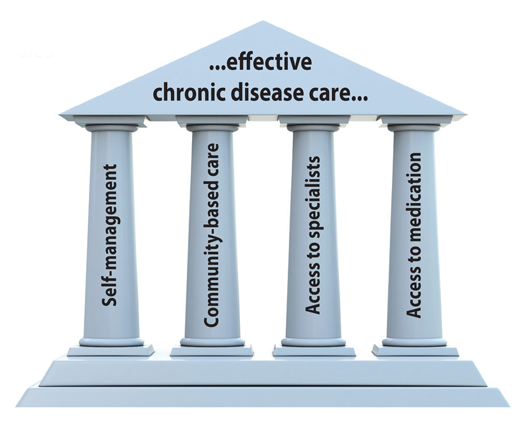 Chronic disease management CANNOT be successful without ALL four pillars in place. There are more than 100 different types of arthritis, including osteoarthritis, rheumatoid arthritis, lupus, gout, and ankylosing spondylitis. Arthritis can affect people very differently, ranging from mild to deadly, inconvenient to totally disabling, and merely uncomfortable to excruciating. Physicians, working with their arthritis patients, are best suited to make treatment and medication decisions. Limited access to innovative medicines limits the ability to effectively manage chronic diseases such as rheumatoid arthritis. In some cases such limitation may be solely responsible for life altering, even life-threatening circumstances. Diseases are individual. So too must be patient treatment. Arthritis is one of the most prevalent chronic diseases, yet it is not recognized as such. One of the challenges, Arthritis Consumer Experts (ACE) faces is undoing the public’s misperceptions about arthritis. Many see it as strictly an “older person’s disease”. When we explain that children get arthritis too, most people are surprised. The fact is that 60% of the nearly 4.5 million Canadians with arthritis are under the age of 65 and more Canadians are affected by arthritis than diabetes, heart disease, or cancer. It is without question, however, a women’s disease: according to Life with Arthritis in Canada, nearly two-thirds (64%) of those affected with arthritis in Canada are women. The next challenge for the arthritis community is determining an effective call to action for Canadian consumers and healthcare professionals, getting them involved in mobilizing the right community leadership and participation to profoundly change how arthritis is perceived and treated as a chronic disease in Canada. For primary care practitioners, nurses and nurse practitioners, we offer tools that will improve their skills and enhance their ability to talk to patients about primary and secondary prevention and early detection of degenerative and inflammatory arthritis. For physiotherapists and occupational therapists, we develop tools that provide relevant information they can incorporate into their practices and promote conversations with their patients about joint complaints and effective primary prevention, exercise and rehabilitation strategies. For pharmacists, we help them expand their role as a partner in patient healthcare who can deliver key information to customers about the importance of sticking to prescribed treatment and encourage patients to learn about self-management strategies. At the public level, our call to action to consumers today occurs in the midst of a patient revolution. There is an increasing wave of consumers researching and looking to online materials for credible and accessible chronic disease identification, medical information and self-treatment strategies. The traditional provider-centric healthcare model that focuses on the chronic disease, with the healthcare professional (HCP) viewed as the ‘knowing’ expert and the patient a ‘passive’ recipient, is becoming obsolete. Patients are taking a more active role in their disease management. Both arthritis patients and HCPs are experts: patients are experts on their lives and experiences of their disease, and HCPs are experts on the clinical side of the disease. ACE believes an arthritis patient is empowered when provided with sufficient knowledge to make informed decisions, given adequate control and resources to implement their choices, and is armed with the necessary experiences to evaluate the effectiveness and impact of the steps taken. A major impediment is that few HCPs are equipped with the medical training, skills, tools, or system support to encourage arthritis patients to consider outcomes, ask questions, and clarify preferences within a visit. From our experience as a leading national advocate and as the founder of the Arthritis is cured! (if you want it) National Arthritis Awareness Program, we have identified technology as the key driver behind the rise and adoption of healthcare partnership into practice. The emergence of a patient revolution, catalyzed by new technology and characterized by the patient/physician/caregiver/pharmacist partnership is under way. Patients are seeking and sharing more healthcare information online and using mobile health such as medical Smartphone apps. Through its JointHealth™ family of programs, which includes weekly and monthly online and print publications, video and audio web workshops, and robust social media communications, Arthritis Consumer Experts (ACE) provides free education and information programs to inform, educate and empower people with arthritis to help them take control of their disease and improve their quality of life. With 6,500 members and 35,000 JointHealth™ program readers and subscribers, ACE is the largest provider of arthritis information, by and for Canadians living with, or interested in, arthritis. The Arthritis is cured! (if you want it) program is Canada’s National Arthritis Awareness Program (NAAP) and the leading source of the newest arthritis information, programs and tools. The co-leaders of the NAAP, Arthritis Consumer Experts (ACE) and the Arthritis Research Centre of Canada (ARC), believe if Canadians start talking about arthritis, a cure can and will be found. Now in its third year of promoting interest, activity and conversations about arthritis and its impact on Canadians, the NAAP has created a new way to broadcast the arthritis story. Arthritis Consumer Experts is pleased to announce the launch of this “go-to” source of arthritis news, education, and inspirational lifestyle stories for consumers and healthcare professionals alike, updated every day. 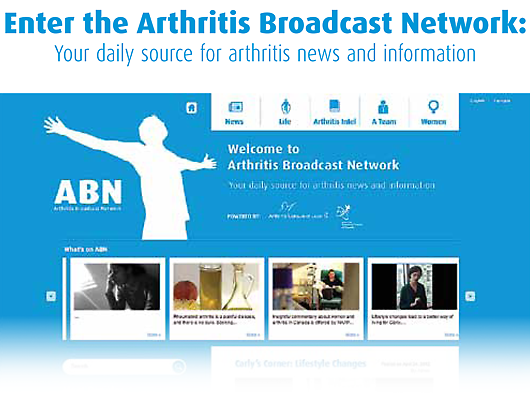 With guidance from its Expert Advisory Panel, the NAAP designed ABN as a multimedia platform to entertain, inform, and inspire people with arthritis to live their best lives. News: Arthritis news. Anytime. Anywhere. But it’s more than just a place that informs and entertains you. Here you can join the conversation. ABN is an ever evolving project: a place where you are a part of the community – and it is a social, interactive, and informative place shaped by its participants. We hear you, now let the world hear you. Share your experience of living with arthritis by sending us your stories, videos and photographs, and we will share them with the world. Please email us at feedback@arthritisiscured.org. To find out more about the NAAP, you can go to www.arthritisiscured.org or visit our Facebook page, follow us on Twitter: @ArthritisCured, or join us on LinkedIn. By building relationships, enabling conversations and sharing stories through the ABN, we will not only engage our public, but also mobilize it to advocate for us at a critical time for arthritis in Canada. In 2012, the Arthritis Alliance of Canada will contribute to the ongoing national healthcare debate by developing and releasing a National Framework for Arthritis. And ACE, through special projects like the Arthritis Broadcast Network, will be there to cover the stories around the making of the Framework and Canada’s implementation of the four pillars for effective chronic disease management,. For information about the Framework, please read our December 2011 issue of JointHealth™ monthly. Sign up for the latest ABN updates, exclusive feature stories, and more! Making a direct link from your homepage. Ask for details. Arthritis is a debilitating and sometimes life threatening disease that affects too many people to go unnoticed and untreated. Let’s work together! Refuse to accept “no cure” for an answer. Speak to your doctor and healthcare team: share the resources available on the Healthcare Professionals Resources section of our website. Healthcare professionals: network with NAAP on LinkedIn.